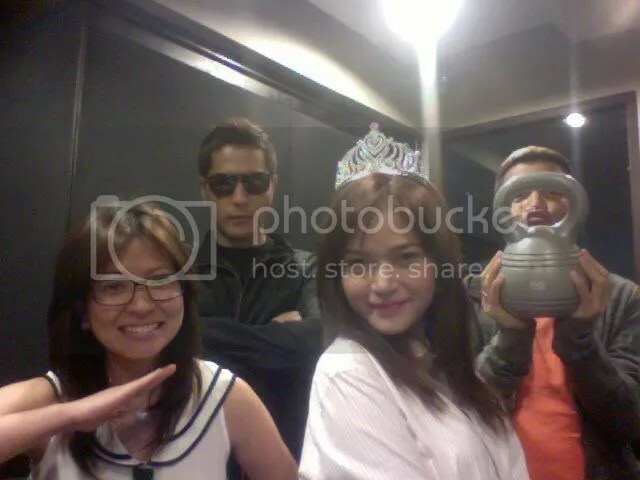 Bela Padilla On The Morning Rush! When we met Bela Padilla during the press launch for the Yahoo! OMG Awards, we knew we had to guest her. She’s drop-dead gorgeous, and has a sharp wit about her to boot! So when she got to the station, she was rarin’ to go, and hit the ground running. Of course we had to have our epic pic. I have no idea why i tried to fit my face into the kettle bell handle, but I guess I’m odd that way. I look like a shmooshed duck. As always, everybody else looks normal. Then of course came our epic rap-off. We skipped a week and missed one rap-off, mostly due to my “Lindsay Lohan”-ish episode, so we promised to make up for it this week. Hopefully we didn’t disappoint. At least we got it in one take! Again, our endless thanks to @JRhyan for always recording our celebrity guests on video every single time, even though he hadn’t had a stitch of sleep. Duper kaduper thanks Jaime!!! Bela actually sounds good enough to be on radio. She’s got this really nice “cool chick” timbre to her voice, and she’s got a really adorable laugh that sounds interminable cute on air. Talk about a complete package! Thanks again, Bela!!! Yassi Pressman On The Morning Rush! It’s been a busy and hectic week, so although it’s a bit late, here’s my post on the Yassi Pressman guesting with the Kikay Barkada! The girl is cray-cray. She fits in so well with the kikayness and the bitchiness that is the norm in the morning. She may be 17, but she can make sabayan with us whatever it was we were talking about. And she got the zingers as well. Since she’s a great dancer, we thought we should skip the rap-off, and go for a dance-off instead. Here was the hot mess that was the first ever Morning Rush dance battle! I swear, she’s a ball of energy! As you can see, I went low batt towards the end of the routine! This half-British kid was a handgul, and that’s just the way we like it in the morning! Cray-cray!